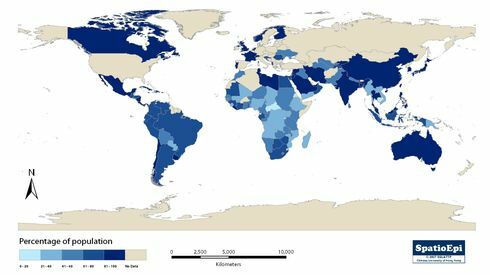 Data source: UN Water Statistics & WHO. Map shows the distribution of reported Cholera cases by country in Africa in the year 2007, expressed in graduated colours from yellow (low) to red (high). The blue coloured symbols in varying sizes represent the percentage national population with access to sanitation facilities. 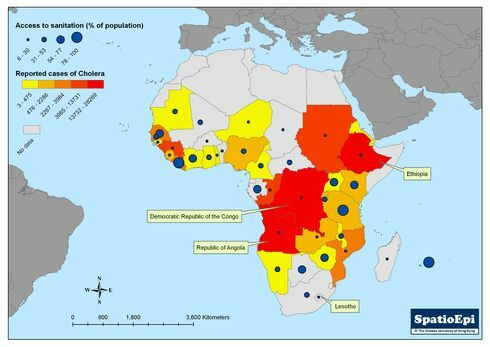 The Democratic Republic of the Congo had the highest reported number of Cholera cases (28269) followed by Ethiopia (24121) and Republic of Angola (18422). It appears that access to sanitation goes contrary to cholera caseload. Ethiopia, for example, had the second lowest access to sanitation facilities amongst all African countries, at 8%, only after Lesotho, 6%. The percentage access for Congo is also low at 9%, while that for Angola is 16%. Cholera is a waterborne infectious disease. Limitation of safe water supply and poor sanitation are the known risk factors. Cholera is an acute intestinal infection caused by the bacterium Vibrio cholerae. Incubation period can vary from a few hours to 5 days. Watery diarrhoea with rice-water like stool and vomiting are common symptoms seen amongst patients, which may lead to severe dehydration and death if no immediate medical attention and treatment given. Cholera is a waterborne disease which is acquired through ingestion of food or water contaminated by V.cholerae. Person to person transmission is unlikely. Cholera vaccines, (including oral forms) are available. 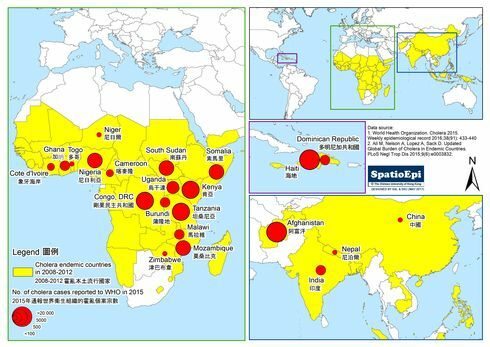 World Health Organization (WHO) is currently evaluating the role of mass vaccination as a public health measure for protecting at-risk population. Hydration is an important treatment strategy. Improving safe water supply, sanitation, food safety and public health education are the best strategies for preventing cholera in the long term.